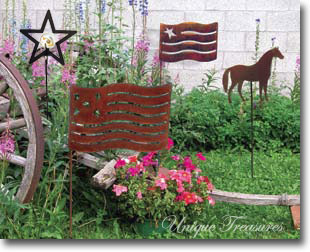 Our lawn / garden stakes from Village Wrought Iron are created of wrought iron. Some have a natural to rust finish and others are finished with a baked-on powder coat to resist rust. We also carry a bear and moose customized option. All of our garden stakes are made for use outdoors.